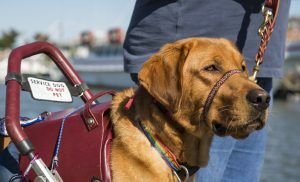 In order for a service dog to be matched with a handler, they must undergo rigorous training in a variety of areas, depending on the needs of their future handler. This could be anything from learning to provide practical assistance to a person with limited mobility to being able to respond appropriately to someone who suffers from post-traumatic stress disorder. Traditional breeds for service dogs have been labrador retrievers, golden retrievers, and German shepherds, but nowadays, almost any type of dog can be trained as long as they meet the requirements. The Pet Experts at Elmhurst Animal Care Center value each and every canine patient. If you have any questions about your dog or would like to learn more about service dog requirements, please don’t hesitate to contact us. Next: Is Pet Insurance Worth It?